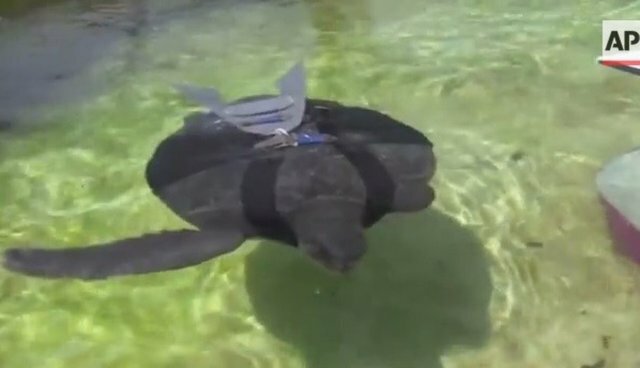 A sea turtle that lost two fins after becoming tangled in a net now swims straighter thanks to a prosthetic inspired by a fighter jet. Borrowing the wing shape from an F-22 Raptor warplane, an industrial design student in Israel fashioned two fins that curve up off of the turtle's shell. With his new wings, the turtle, named Hofesh -- a Hebrew word meaning "freedom" -- has better balance and can surface more easily to breathe, says Shlomi Gez, the design student. Gez had affixed one wing to the turtle's back like the fin of a fish, but Hofesh struggled to stay afloat. The double-winged design "worked better than one fin on the back," Gez tells the Associated Press. "With two fins, he keeps relatively balanced, even above the water." Despite his spiffy new fins, Hofesh won't be able to return to the sea -- but he can still play a role in helping his fellow endangered green sea turtles. "We have great plans for this guy," says Yaniv Levy, the director of the Sea Turtle Rescue Center. "He and his girlfriend here," Levy says, "are both part of our breeding stock." Should Hofesh have any children, they'll be set loose in the ocean.